DOHA, Qatar, 2017-May-11 — /Travel PR News/ — Qatar Airways celebrated the opening of KidzMondo Doha’s interactive edutainment establishment on Wednesday, during a special ceremony held at the kid-sized city at Mall of Qatar. The inspiring partnership offers children a dynamic and fun introduction to their preferred roles as pilots and cabin crew, for an understanding of the exciting vocations available to them within the world-class airline, at Qatar’s one-of-a-kind edutainment city. Under the patronage of His Excellency Jassim bin Saif Al Sulaiti, Minister of Transport and Communications, the opening ceremony was hosted by Qatar Airways Group Chief Executive, His Excellency Mr. Akbar Al Baker and Mr. Ali Kazma, Chairman of Kidz Holding and Founder of the KidzMondo concept. The special event was also attended by Qatar Airways Chief Commercial Officer Mr. Ehab Amin; Engr. Badr al Meer, Chief Operating Officer of Hamad International Airport; Mr. Moutaz Al Khayyat, Group Chairman and President Power International Holding; Mr. Ramez Al Khayyat, Group CEO and Vice President of Power International Holding and Mr. Nabil Barakat, General Manager Aura Entertainment Services, alongside distinguished guests and media members, during which the invitees were taken on a special tour of the city’s unique indoor establishments. At KidzMondo Doha, Qatar Airways will offer an insight into the complete travel experience for children to take on roles as passengers, as well as airline staff, within the specially-adapted real aircraft model. Children will be able to explore the plane, examine its different parts, and experience the daily tasks required of Qatar Airways staff. 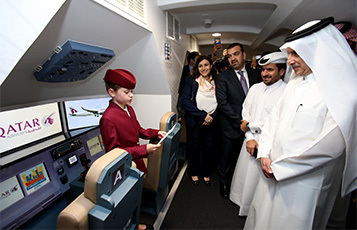 Children will also be able to play the role of cabin crew, learning about the safety and service standards required of all aviation professionals, and other children will live out the excitement of being a pilot, in a Qatar Airways cockpit. There will be a specially-adapted real Qatar Airways aircraft to set the stage for both passengers and staff on board. Children can also adopt the role of an airport agent, issuing boarding passes to visitors at a replica of Hamad International Airport’s check-in counter. Upon arrival at KidzMondo Doha, the youngsters’ journey begins with check-in, where they enter the city to become part of an amazing experience, becoming official ‘Kidizens’ of the city. The Aviation Academy is one of the key attractions offering aspiring pilots the experience of flying two of Qatar Airways’ flagship aircraft – Boeing’s 787 Dreamliner and the Airbus A380. Simulators are designed to demonstrate the exhilarating moments of taking off and landing at Qatar Airways’ gateway to the world, Hamad International Airport in Doha. If children are more interested in staying up in the clouds and becoming one of the iconic Qatar Airways cabin crew, kids can role-play and learn about the safety and comfort of their customers on board. Parents will be able to join in the fun too as they participate as passengers receiving the inflight hospitality from their young ones. The indoor theme park will offer children aged between two and fourteen realistic role-playing activities, which uncover childrens’ innate creativity, through fun-learning within the boundaries of the kid-sized city. The entertainment park, complete with its own economy and currency, has been designed to holistically educate children by developing their cognitive, emotional, psychomotor and social abilities through exciting activities of the theme park’s different establishments. Chairman of Kidz Holding and Founder of the KidzMondo concept, Mr. Ali Kazma commented: “It is a pleasure and an honor for KidzMondo to partner with Qatar Airways, one of the world’s fastest growing airlines and youngest fleets’ operator. We value our mutual vision in positioning Qatar on the world’s top tourism map in promoting the country as a destination for exploration, entertainment and culture”. “Qatar Airways aircraft simulation at KidzMondo’s entrance, Qatar’s first edutainment city, will mark the beginning of every kid’s journey at KidzMondo and this will continue to tap into airline’s potential beyond its tourism and hospitality supremacy, in activating its role as a trusted partner in transforming the educational landscape in Qatar”, added Kazma. KidzMondo Doha provides children with a relevant and tangible learning experience, indicating the growing need across the world for unique experiences aimed at children and youth that combine entertainment and education. Before they can ‘live the role’ of their adult counterparts, Kidizens have already experienced the ‘at-first-glance’ inner-workings of an adults world, like checking-in at the airport. Considering the range of opportunities children can explore, Kidizens can engage in unique activities in a dynamic and safe environment, built as a replica of the real world, powered by its own currency, constitution, economy and functioning infrastructure.. This distinctive experience is further augmented with the special curricula that has exclusively been designed to educate children and foster their development in a fun way. Built on a total indoor area of about 8,000 sq m, KidzMondo Doha offers various sponsored activities in the kids’ city in the Mall of Qatar. KidzMondo is actively present in Beirut, Istanbul and Qatar, with further expansion plans across the GCC, MENA, Levant and International regions – including Russia, Australia and Azerbaijan – with the aim of becoming the number one edutainment destination in the world. This entry was posted in Airlines, Business, Entertainment, Travel, Travel & Kids, Travel Education & Courses, Travel Marketing, Travelers and tagged Akbar Al Baker, Ali Kazma, children, Doha, Jassim bin Saif Al Sulaiti, KidzMondo, learning experience, Qatar Airways. Bookmark the permalink.